Yes, we’re trading the T@B. Despite the fact that I LOVE it, the T@B is too small an RV in which to spend the winter and that’s what we plan to do this year. So, we’re upgrading to a 23-footer. Don’t worry. We haven’t given up our green ways – we picked one that is uber-lightweight. Will show you pics once we get it. But we ordered it today and they want to know what interior colors we want. I’m having a hard time choosing between the 2 options shown in the screenshots below. Tamarak; Moon Beam is way to busy. Just one mans opinion. . .
“uber-lightweight”? May be green, but not always safe….crosswinds will make for some tense driving. Just my opinion…in another life,(in other words…..YEARS AND YEAR AGO!, I was a long haul truck driver. Seen a lot of unhappy stuff involving wind and holiday trailers…. Not to rain on your new purchase….again just an opinion. Hmmm… love those Sebring convertibles! So guessing that you travel in our neck of the woods from time to time.. you should let us know when you’re hitting the road! I personally would see if they would contact the folk that have the Route 66 patent, same colors more travel related. But being stuck I would go with Moon Beam. First of all, congratulations on getting the new RV! This is an exciting day! The choice of colors is a toss-up. Here are some thoughts. 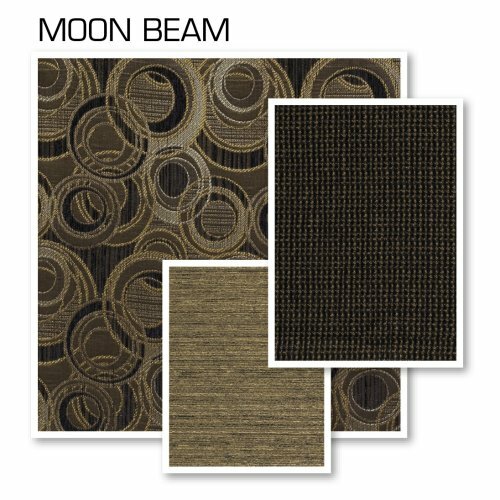 Moon Beam with its circles seems to be a busier pattern, and the two accent pieces are darker. Does the carpet color look like one that would show dirt spots, especially sand, etc.? If I were going with this pattern, I would be tempted to add my own decor with accent colors, even possibly using red or another bright, happy color, and possibly something with a few circles or maybe even another geometric pattern. Tamarack’s pattern does not appear as busy, even though it appears to have a larger pattern. The only concern on this one is where the plain color is used and if it will be in an area that may get less wear, etc. There might be more colors you can pull from the Tamarack pattern if you are going to add any decor, but it might be harder to pick an accent color with contrast unless you choose one of the existing colors in a darker shade, use lighter variations with it, and add complimentary shades, such as yellows, greens etc in the right shades and smaller flowers. I see some hints of gray, so it is also possible you could opt for some blue decor. There are a lot of possibilities with this pattern. Normally, darker colors tend to make areas seem smaller, and lighter colors tend to make areas look larger. For this reason, I would probably go with the Tamarack. We had an RV with a similar pattern and similar neutral colors and it was very workable. The only reason I would pick the Moon Beam is if I could add my own decor and detract from the darker colors. I am one who typically likes earth tones because I can add accent colors, and they are easy and less expensive to change when you want to have a different look. Good luck with your choice. I hope this helps you decide. You will be happy with either one when your unit arrives, because they both have great possibilities. Decor that you may want to add can also reflect music and activities that you enjoy. I like the name Moonbeam, but it is too busy. I spent or tried to spend the night in a Holiday Inn in Ventura CA and the walls had these little red roses on them. All I could see even witht he lights out were these little red roses. The round circles remind me of that, as well as the darks are too dark, even for a 23 ft rv. Is this a trailer or self contained? So for me its the Tamarack. I’ve been a big fan for a couple of years! Admire your work. I bought your book in 2006, read it back to back more than once, and learned a great deal. I choose Tamarack for your new RV. Tamarack has more color and depth. The sage green, the dark rust, earthy browns, and even the leaf pattern. It reminds me of the Okanagan. It’s earthy, yet it inspires outdoor thinking, and travel. When you’re away, it can remind you of home. You could even add some dried lavender to the decor. Tamarak – love the leaves! both are nice I can see where this would be a hard choice….but, Tamarack I think would be my choice. Tamerack is a lot more soothing personally. But you’ll like whatever you choose. Moon Beam is my choice! Can’t wait to see the new RV. Tamarack but with the Moon beams dark accent color. I think it will balance out the dark parts of Tamaracks design. Would love to see pictures of your new RV. You are living my dream. I’m going with Moonbeam but that’s cuz I have kids and I know what camper floors look like with kids. I’m sure you and Ed know how to wipe your feet. LOL 🙂 As far as camper vs motorhome… I’m camper all the way. We have a motorhome right now and I can’t wait to pull in a few extra commission checks to replace it with a camper. I like having the freedom to go for an afternoon drive when camping and I don’t like pulling anything behind our motorhome. When we get things that we like we are feeling happy and energised because they fit with what we already are comfortable with. The leaves even though something that would suit yourself and Ed, due to the fact that both of you love nature, would not necessarily be as enegrising as the second pattern. Reason is that both of you have already expressed shapes you are comfortable and happy with. One of Ed’s passion is his watch collection and one of yours is “Roamsters”. Circles! PS. Does Vic gets to use the RV or is he scared of vehicles? That was a really good observation… I really do like circles. 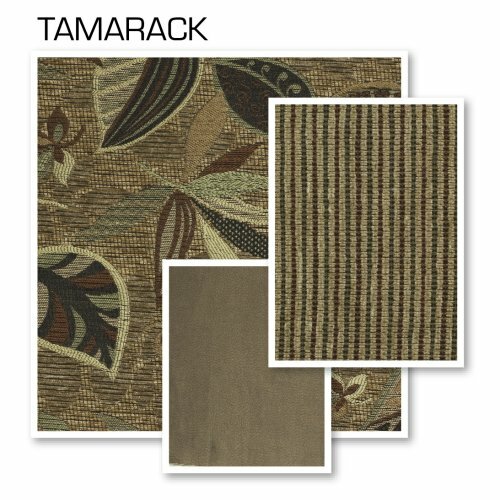 But the readers spoke and chose Tamarack, a pattern that we loved as well. Either would have been great. Moon beam definitely. Stick with the ORBS – it’s like being home. Tamarak with the “fuzzyer” carpet, you won,t see the dirt as well. I have had rv’s, trust me texture and patterns and color are good! I agree with Erika, I also choose Tamarack because of the color combination, and just the fact that there is more color. These are also two totally different designs. Tamarack is more comfortable and casual, while Moon Beam’s look and feel is more contemporary and sophisticated. Since I’m usually a casual guy, Tamarack is my choice. True be told I don’t like either one! I like the Tamarack. You get a little of everything: angles, curves, solid blocks of color and a linear pattern, and the color palette is a little warmer. Congrats on your new purchase! I rather like MoonBeam. Busy? yes, but something will always spill no matter how careful one is. I would pick the Tamarack as it has the beautiful flora/fauna feel to it with the additional green and rust colours in the pattern. Glad you are not giving up your travels as I love reading about your adventures. Happy Trails!